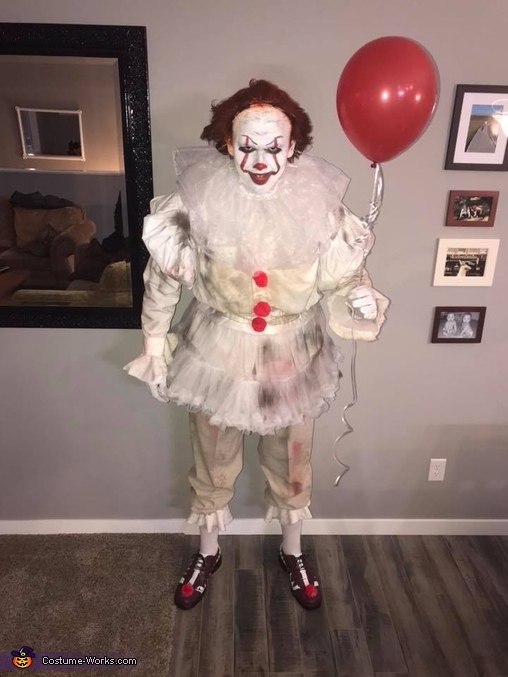 My boyfriend, Sam, and I worked together to create the perfect Pennywise costume (Sam is wearing it). It was hard to vision the costume coming together, but once all the pieces were in place, the outfit was perfect! We started by going to Goodwill and buying a mens cream long sleeve button up and a cream women’s maternity pants as the base of the top and bottoms. We also purchased a tablecloth from goodwill so we would have fabric to add for the arm and leg details. Once we got the base down, we then started brainstorming what would work best for the skirt and neck fabric Pennywise wears. We decided tutus would work best! We then went to Party City and bought an adult tutu for his waist, and a child’s tutu for his neck. While shopping at Party City, we began to think of things that would work for the shoulder puffs. Just when we thought we were out of hope, we saw baker hats! We bought two baker hats, cut holes in the middle, and sewed them onto the base shirt’s shoulders. Our next focus was the arm and leg cuffs. We wanted the arm cuffs to stick out some, so what we did was use styrofoam and wrapped fabric over it. It turned out great! We then sewed on some red balls, got the costume dirty (had to make it look scary) and we were just about complete. Last, but not least, were the shoes. For the shoes, the biggest struggle was finding a cheap pair that would fit my 6’6” Boyfriend. We luckily came across a pair of nice black dress shoes from Goodwill for a pretty good price! We brought them home, painted them white, added the red detail, and sewed on two more red balls. After days of hard work and dedication, our homemade Pennywise costume was complete.